Places change their geographical focus through time. For most of the twentieth century, Corn Exchange was the commercial, literary, ceremonial and municipal centre of Stirling. 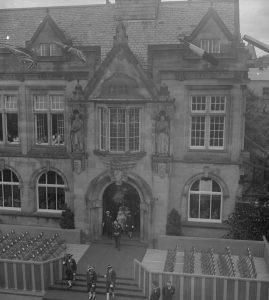 Shown here is a royal visit at the Municipal Buildings in 1929. The Municipal Buildings were opened less than 100 years ago in 1918, joining the Corn Exchange Hotel with its hiring market, the Carnegie Library (opened 1904), the Campbell Bannerman statue (1913) and the Burns statue (1914). The War Memorial completed the grouping in 1922. One of the most important businesses in the area was McArees who owned property facing Municipal Buildings, as well as their large store in King Street. In 1937, they built the present red sandstone building opposite Municipal Buildings and for a century had a grand stand view of the historic visits taking place. This photograph is from a collection presented to the Stirling Smith by Mrs Elizabeth Young of McArees. The entrance to Municipal Buildings where the Duke and Duchess of York are emerging has an outdoor seating area for the ceremony. The windows of the Council Chamber above are wide open, and three Halberdiers dressed in their distinctive red uniforms are on the front steps. Today both Stirling Council and McArees have moved on.